Do you ever get super specific cravings for really particular foods? For me, it’s often toast with strawberry jam. There’s no toaster readily available at the house where I’m currently staying, so I’d been missing this breakfast favorite. 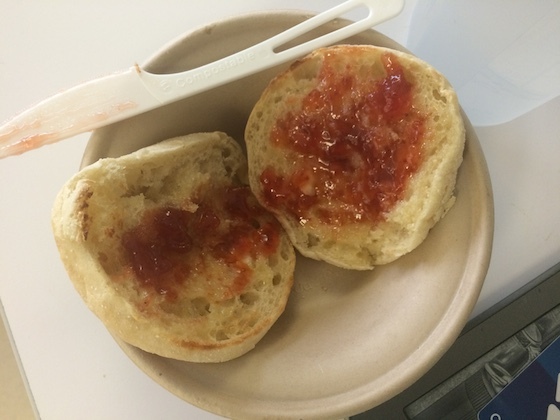 Yesterday morning, I found a pack of English muffins in the office kitchen – yes! I popped one in the toaster and topped it with butter and strawberry jam. I wasn’t super hungry (after an amazing three course meal the night before with my aunt and mom) so this was perfect. 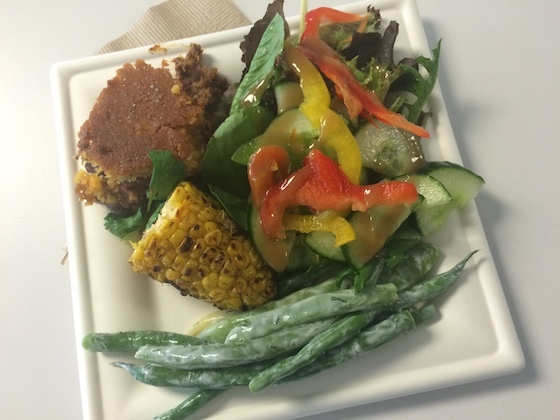 Lunch was southwestern-inspired: tamale pie, roasted corn, beans, and some salad. The pie made me so nostalgic, because my mom used to make this dish every Halloween. My entire extended family would come over and we’d eat it in our costumes before heading out to trick-or-treat. I have to admit, my mom’s was way tastier. I knew I’d be getting home late, so I snacked on a bowl of cereal mid-afternoon. After work, I met up with a potential roommate to chat about possible apartments – hopefully we’re making some progress. By the time I got home, I was totally exhausted. I really wanted to fit in a workout, but I could tell that my body just wasn’t up for it. So, I settled for a hot shower and yummy dinner. Look familiar? Yep, it’s leftovers from Monday. 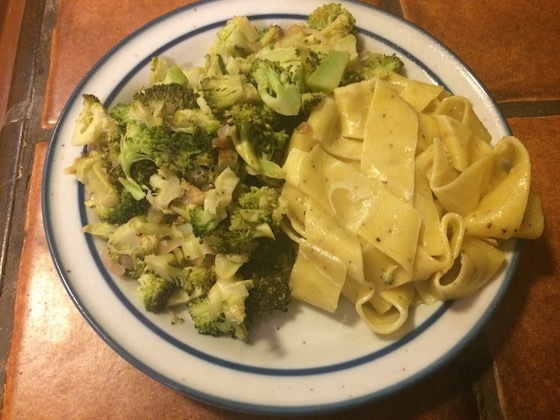 I heated up the rest of my pasta and broccoli. I couldn’t even muster the energy required for chewing a salad, but made up for it with plenty of broccoli. I finished off the night with a spoonful of peanut butter. Hopefully today won’t tire me out quite so much! Let me know in the comments below: what have you been craving recently?